data Recovery with their hands. Display search results file structures. Задание папки для записи данных. General description of the program. The main menu of the program. Selecting a disk for analysis. Specifies the folder for recording data. Send the results of the analysis. Displaying results of searching the file structures. After the end of the operation find elements of file structures for a particular disk, displays the message presented in Fig. 13. Рис. 13. The message about the end of the search file structures. Рис. 14. 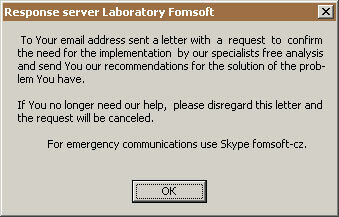 The response from the server the Laboratory Fomsoft. Fig. 15. Letter asking to confirm the necessity of performing the analysis. This letter serves to control the correct email address and confirm analysis and development of recommendations of experts of the Laboratory Fomsoft for solving the problem. After confirmation, the request will be forwarded for execution to the specialists of the Laboratory Fomsoft. By default, the analysis runs for two days. If the need for our help has disappeared, this letter can be ignored, the request will be automatically cancelled. For emergency communications use Skype fomsoft-cz. 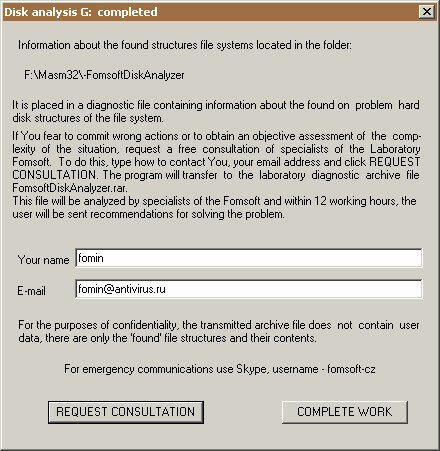 Laboratory Fomsoft - Service remote data recovery and photos with his own hands. date of last adjustment - 19.07.2017.